Pakistan's Gulalai Ismail delivers an acceptance speech after being awarded the Prize for Conflict Prevention for the work of her organization Aware Girls promoting women's issues and equality in Pakistan, during the award ceremony of the Jacques Chirac Foundation in Paris, Nov. 24 2016. A female Pakistani rights activist has broken with tradition and set a precedent by seeking legal action against the person who accused her of violating the country’s anti-blasphemy laws. Gulalai Ismail, founder of the Pakistan-based, nongovernment organization Aware Girls, was accused of insulting the religion of Islam, a charge she denies. Hamza Khan, 23, a student from Khyber Pakhtunkhwa province, started a social media campaign against Gulalai, accusing her of “insulting religion and Pashtun culture.” He seemingly was unhappy with her role as an activist. Khan, who claims to be the president of Mardan Youth Parliament, uploaded a 12-minute video on his Facebook page, November 20, 2017, in which he called for a mob to attack Gulalai for her alleged acts of blasphemy. 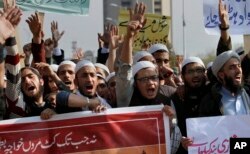 FILE - Pakistani students of Islamic seminaries chant slogans during a rally in support of blasphemy laws, in Islamabad, Pakistan, March 8, 2017. Hundreds of students rallied in the Pakistani capital, urging the government to remove blasphemous content from social media. Fearing for her security, Gulalai filed a case against Khan on November 21 with the country’s Federal Investigation Agency (FIA), which led to Khan’s arrest this week after a Peshawar court issued a verdict against him. Pakistani authorities intervened, and Facebook removed the video, in which Khan is heard saying that Gulalai must be “eliminated” to safeguard Islam. Gulalai told VOA she wants to be a voice for those who have been wrongly accused. “I wanted to set a precedent so that other human rights activists and other young women can speak out and can use their right to freedom of expression without the fear of being silenced in the name of religion,” she said. Additional Sessions Judge Ayesha Arshad in Peshawar dismissed a bail application for Khan. Some see the order that led to the arrest of Khan as a bold move by Arshad. Noreen Naseer, a professor of political science at the University of Peshawar, credited Arshad for her “daring” decision. “It has set a precedent that if anyone tried to malign, threat[en], or use any other mode to harass and scare the women activists, then the consequences will be of serious nature,” Naseer said. Gulalai’s actions were also celebrated by other activists. “I think she did the right thing and took a big step that most women don’t, because harassers are the majority, especially if they belong to political parties,” Nadia Khan, a social media activist, told VOA. “I think Gulalai has given hope to women who go through this and are convinced by men to let it go because of the consequences,” Nadia Khan added. Gulalai’s Aware Girls organization, which is based in Peshawar, has been working for gender equality, education and female empowerment in the border regions of Afghanistan and Pakistan. Her work as an activist has brought other cases of harassment as well. 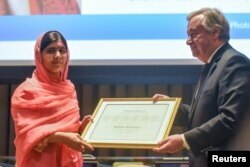 FILE - Malala Yousafzai attends a ceremony with United Nations Secretary-General Antonio Guterres after being selected a United Nations messenger of peace in New York, April 10, 2017. Her organization is also cooperating with the Malala Fund, a global organization that works to provide education for girls in countries around the world. The fund is named after Malala Yousafzai, who won the Nobel Peace Prize in 2014 for her activism in education and her resilience against the Taliban. Gulalai founded Aware Girls at the age of 16 and has since received international recognition for her activism, including being given the Anna Politkovskaya Award, established in the name of a slain Moscow journalist. The anti-blasphemy law remains a controversial issue in the Muslim-majority country where anyone labeled as blasphemous faces dangerous consequences. The laws are strictly enforced in Pakistan, and punishment for those found guilty is harsh. In some cases, when courts have not charged suspects, ordinary Pakistanis have taken the matter into their own hands. A simple accusation that someone has committed blasphemy can lead to threats against the suspect. At times, it can mean death. Last week, a student of Charsadda New Islamia College killed a principal after accusing him of blasphemy. The video of the accused killer went viral. In it he bragged about his actions and said he had no remorse. Last year, a Hindu man was rescued by police from a mob in Hub, Balochistan. The man had been accused of posting blasphemous content on social media. And in April 2017, Mashal Khan, 23, a journalism student of Abdul Wali Khan University, Mardan, in Khyber Pakhtunkhwa province, was beaten to death by fellow students. He had been accused of posting blasphemous content online. Hamza Khan, the person who accused Gulalai of blasphemy, organized a protest against her in the same area where the protest was held against Mashal Khan. Gulalai wants her case to set a precedent for those who use religion to incite violence. “In Pakistan, it has become very easy to use religion for silencing people, especially human rights defenders. We have seen how, in the past, blasphemy has been used as a political tool,” she said. She said she would also file a case against Hamza Khan under the country’s anti-terrorism act, because she says he has terrorized her with these baseless charges. Gulalai blames what she calls Pakistan’s flawed education system, which has been focused on creating patriots and “good Muslims,” she said. “It’s not the fault of Hamza Khan or his friends. The real perpetrator is the state that intentionally indoctrinates our children and youth in education institutions,” she added. Last year, Pakistan’s government formed a regulatory body to monitor and block blasphemous content online in an effort to further extend the enforcement of the country’s anti-blasphemy law into cyberspace. Rights groups charge that the state’s commitment to enforcing the anti-blasphemy laws actually contributes to an environment where some feel empowered and emboldened to take matters into their own hands.